During a recent stream, New York Excelsior Overwatch player and impossibly pleasant married person Jong-ryeol “Saebyeolbe” Park came up against a particularly unpleasant foe. 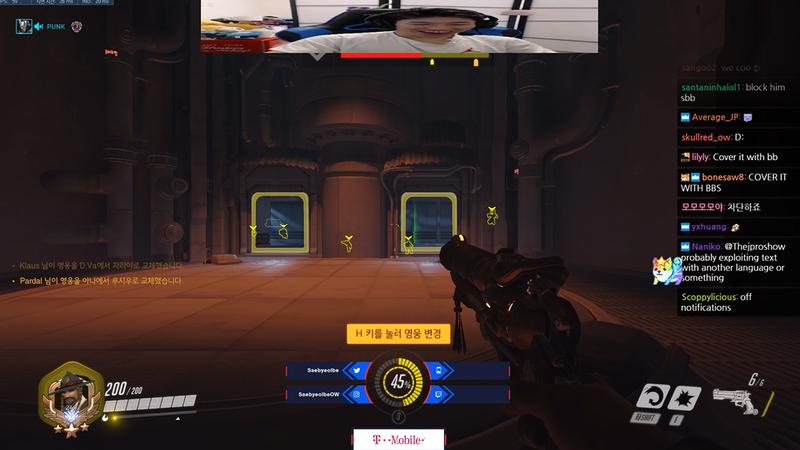 Another player decided to use Overwatch’s in-game notification system to spam Saebyeolbe with a racist message he couldn’t immediately block. The racist assbag in question continuously sent Saebyeolbe friend requests using a handle that contained slurs and threats, seemingly relying on some sort of exploit to get around Blizzard’s language filters. Typically, when people pull this kind of thing during somebody else’s stream, they take advantage of stream extensions—say, an on-screen text or audio message they can prompt by donating—which a streamer can immediately shut down. In this case, however, Saebyeolbe did not have that luxury. Saebyeolbe’s solution was as elegant as it was on-brand. After a period of frustration, he grabbed his own image from his live camera and dragged it from the bottom right corner of the screen to the top-middle, where the racist message kept appearing. Then he changed the dimensions of his own face so it perfectly covered the message. At that point, even the attention-hungry-hungry hippo of a racist troll realized they’d been outplayed. They gave up shortly after.